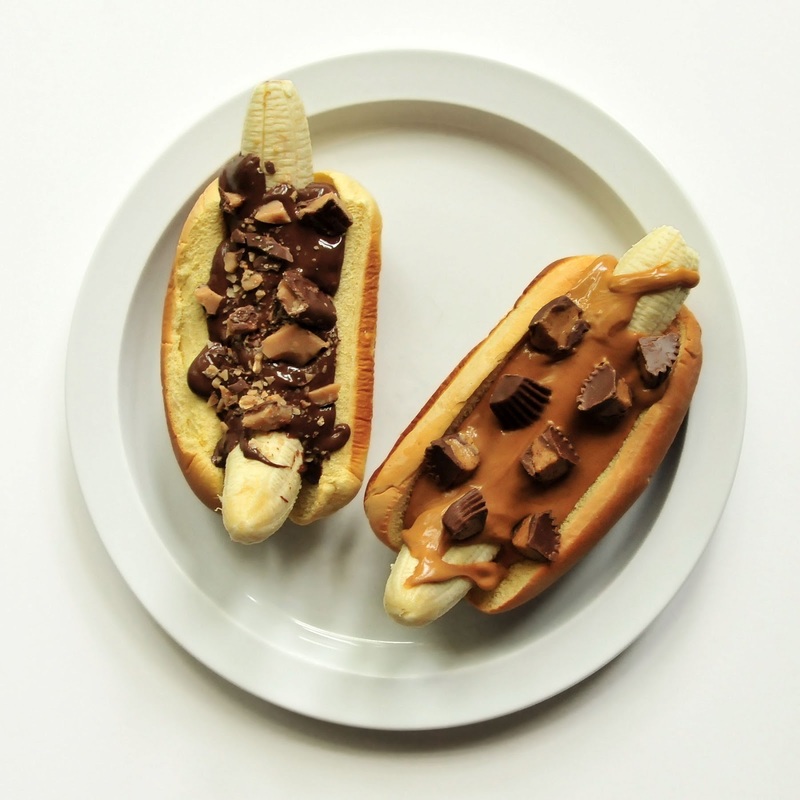 As cookout season approaches, people start to look for ways to use up uneven amounts of hotdogs and buns. Taking a note from Japadog, a Japanese style hotdog stand from the US and Canada (they serve ice cream on a bun instead of a cone), I've come up with this sweet treat in a bun that may help use up your extra bread products. Did you ever notice that bananas fit perfectly on hotdog buns? Well, they do. 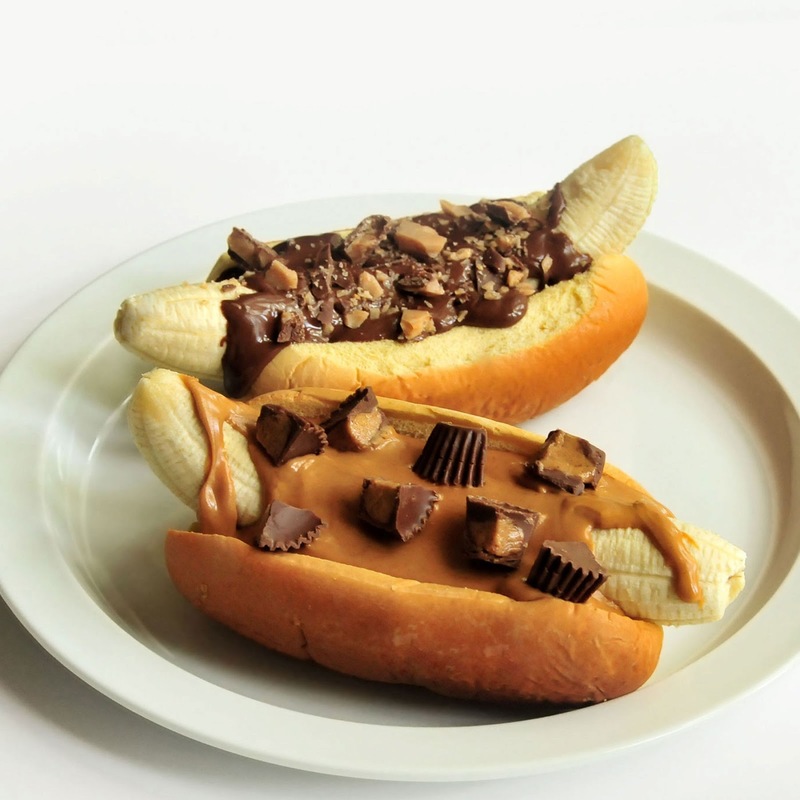 It might seem like a strange combo, but its just another arrangement of the classic peanut butter and banana sandwich but open-faced and with a dash of humor. It could also be fun to add fresh sliced strawberries, whipped cream, chocolate sauce, sprinkles, or anything else you might find on an ice cream sundae. Start by toasting your bun. When the bun is finished toasting, let it cool a bit, then peel the banana and place it in the bun as you would a hotdog. 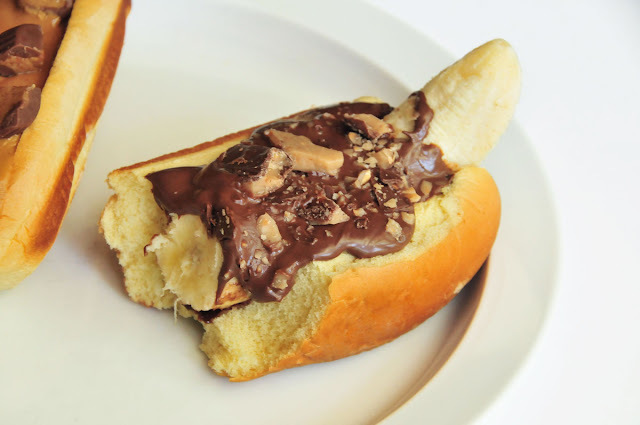 Gently spread the peanut butter or Nutella on top of the banana. Prepare your toppings so they can be sprinkled on top of the banana dog. I chopped my peanut butter cups into quarters and smacked the heath bar against the counter a few times to break it up. Sprinkle/drizzle the toppings on, they should stick to the peanut butter and stay put. OMG That looks so good. Great idea!